The kids are back to school. Summer is at the tail end; in Texas we will still have a few weeks of heat & then the more pleasant weather creeps in. Hot it is here, but I still feel sorry to see the summer go.The Labor Day, almost officially announced that summer will be gone soon, & gone will be the delightful fruits, berries, the warmth & the colors. I had encountered a recipe in the Food & Wine that had used squash blossoms along with skillet grilled tomatoes. Some time back Ilva of Lucullian Delights had posted a pasta which had fennel in it, & since then I had been wanting to use fennel with the so delicious tomatoes we are getting right now. I used fennel here, which the original recipe did not have, & I have to say I loved it. The basil is growing in the pots inside my house; I had almost given up on them, but they are doing pretty good! Roughly grind the Fennel Seeds with a mortar & pestle. Heat a skillet (preferably a cast-iron) over high heat until smoking. 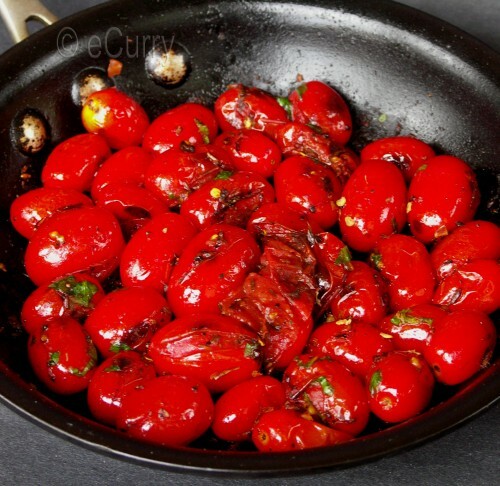 Add the olive oil, tomatoes and cook until the tomatoes are lightly charred and about to burst, 3-4 minutes. Add the fennel seeds & give it a good toss. Switch off the heat, stir in the basil. Season with salt and pepper and serve right away. They were just so aromatic & wonderfully delicious just by themselves! I have made this a couple of times now & did a pasta sauce with the same flavors, which I might post later. I had Arjun try to take pictures of the tomatoes falling from the skillet – in action 😉 But with all the lighting issues, none came out too good. The second picture was one of them. September 9th, 2009 | Category: Sides & etc. Hmm the tomatoes look all glossy and I am sure delicious in taste! ummm….they look delicious! The fennel seeds sound like a wonderful addition. A wonderful idea and a nice flavorfucombo! Yummy! Hi! This looks tooo good to resist. Love the bright red color. Great way to use up those grape tomatoes! 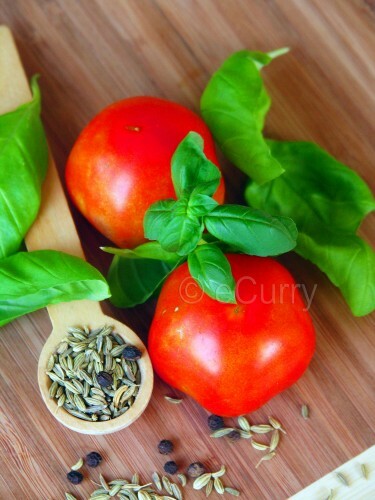 I love the thought of adding fennel to tomatoes. Great ideas! Wow thats looking so good and tempting… PErfect roasting..
looks like we’ve both had tomatoes in mind! i love the simplicity of this dish. 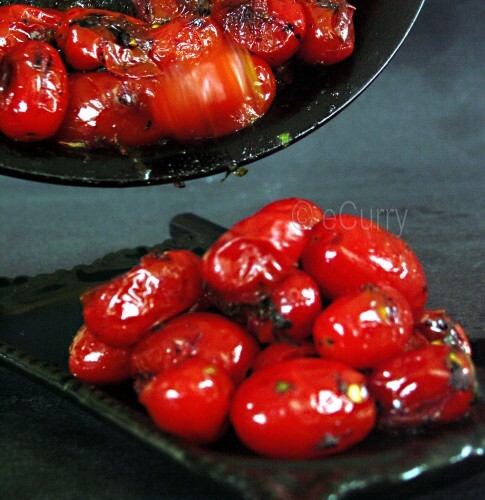 The skillet charred tomatoes look so good, and fennel sounds great with these. I’d love this with pasta! Delicious tomatoes and I love the addition of fennel here! What a click! Esp the second one! beautiful !! What color !! What flavor !! I bet the fennel was wonderful with these tomatoes! Looks really delicious! The tomatoes look like jewels 🙂 Wonderful pic. They look delicious! Love the flavors in this dish! So did you serve it with anything or just on its own as a starter? We ate up most of it just by themselves. With whatever leftover, i had made a small scale pasta. A few times after that, I cooked pasta with the tomatoes. Will post that sometime later. Thank you very much, Soma! excellent!!! love the idea! !sure gonna try this!! That is an incredible recipe! Who have known, a simple tomato can be made into a delicious delicacy!